Providence, R.I. – July 18, 2017 – For the second year in a row, all students enrolled in the two-year Master of Science in Physician Assistant Studies at Johnson & Wales University have graduated on time and passed the board certification exam administered by the National Commission on Certification of Physician Assistants. 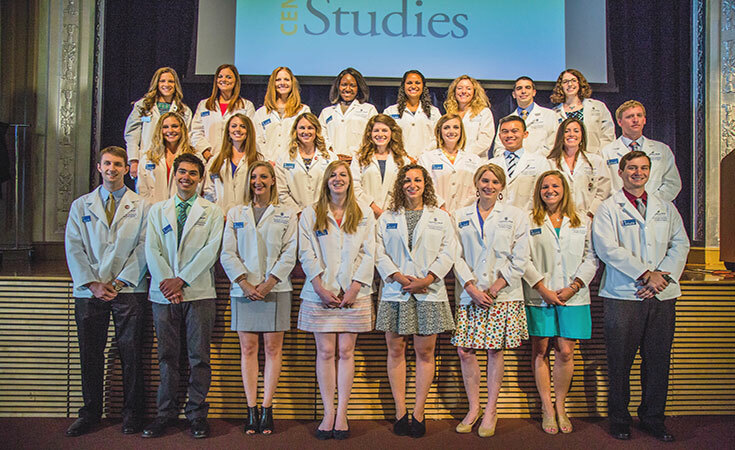 Of the 24 physician assistant students who graduated this May, 10 have accepted positions in Rhode Island. In June 2014, Johnson & Wales launched Rhode Island’s first physician assistant program. The first year of the two-year, year- round program includes classroom instruction, with the second year for clinical rotations. For more information on JWU’s Physician Assistant program, visit: http://www.jwu.edu/PA/. Founded in 1914, Johnson & Wales University is a private, nonprofit, accredited institution with more than 15,000 graduate, undergraduate and online students at its four campuses in Providence, R.I.; North Miami, Fla.; Denver, Colo.; and Charlotte, N.C. An innovative educational leader, the university offers degree programs in arts and sciences, business, culinary arts, design and engineering, education, health and wellness, hospitality, nutrition and physician assistant studies. Its unique model integrates arts and sciences and industry-focused education with work experience and leadership opportunities, inspiring students to achieve professional success and lifelong personal and intellectual growth. The university’s impact is global, with alumni from 123 countries pursuing careers worldwide. For more information, visit www.jwu.edu.